The Buddhist temples and landscape in the ancient town of Hiraizumi, Iwate Prefecture, in northeastern Japan, have won approval as a World Heritage cultural site at an ongoing UNESCO meeting in Paris, Japanese government officials said Sunday. Hiraizumi becomes Japan's 12th World Heritage cultural site, according to the decision by the U.N. Educational, Scientific and Cultural Organization's World Heritage Committee, and follows endorsement of the Ogasawara island chain in the Pacific south of Tokyo as the country's fourth natural heritage site. The registration of Hiraizumi on the World Heritage List, the first in the country's northeastern Tohoku region, would be a boon for the region devastated by the March 11 earthquake and tsunami disaster, as it is expected to boost tourism." This Kondo, Hall of Gold, is an important part of Chusonji Temple, Hiraizumi. 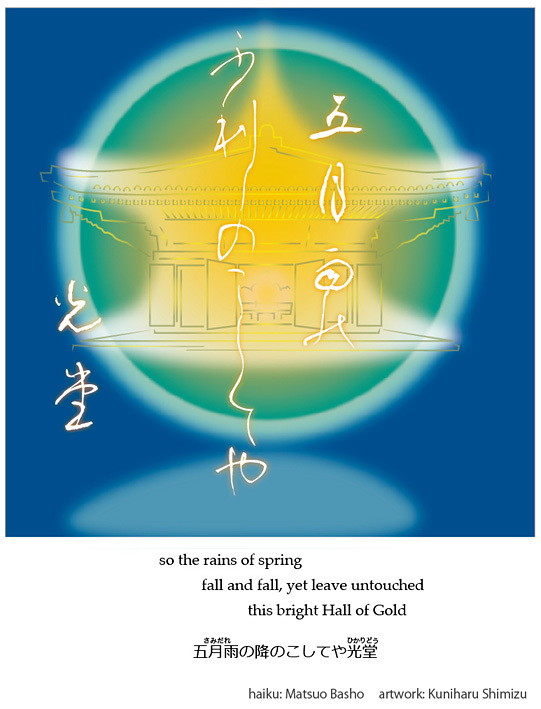 To commemorate the official registration to World Heritage, we will make a postcard from this haiga and make it available at our coming haiga exhibition. Congratulations to Japan on having Hiraizumi become Japan's 12th World Heritage cultural site.